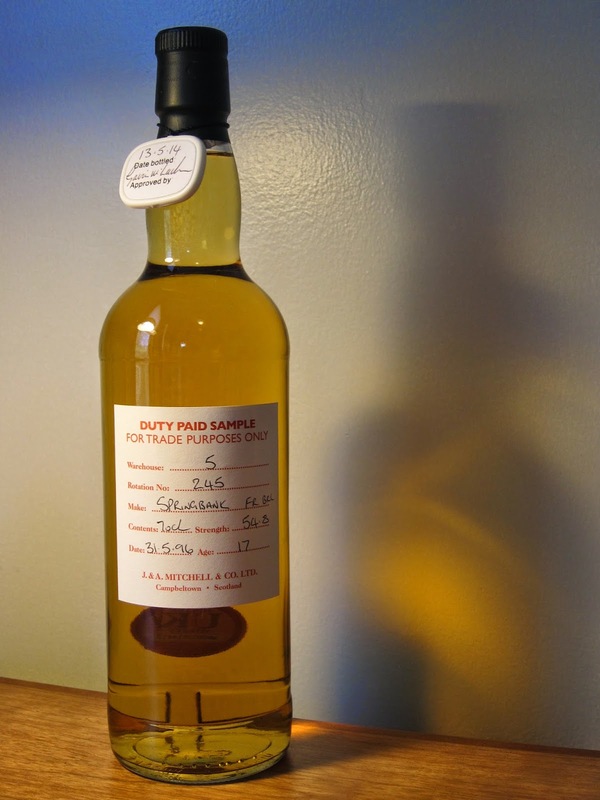 Springbank Cask Sample 17yo Fresh Barrel (54.8%): This is the bottle I brought back from "The Cage" back in June this year. For those who don't know what "The Cage" is, it is the locked cabinet covered with chicken wire located at the back of the of Cadenhead's shop in Campbeltown where they keep the cask samples. I did spend some time during the whisky school at the Springbank Distillery to fill some of those bottles and believe me every single of them is special. I wish I could afford more bottles but I knew they will be expensive. So, I made up my mind before I even go there and got focused to find a Springbank from a fresh barrel. I waited patiently till my last day and voila! I nailed it... The sample is distilled May 31st, 1996 and bottled May 13th 2014 from the cask #245 from Warehouse No.5. It's almost 18 years old and bottled at cask strength of 54.8% abv. Color: Light amber, yellow gold. Nose: Newly bought cardboard boxes, Granny Smith apples, cookie dough and green wood shavings. Noses surprisingly young and fresh... Fresh fennel, grilled asparagus and campfire you find the next morning left to die from the night before. Water amplifies the green aromas: Fresh green banana peppers, dandelion leaves and Belgian endives. Palate: Very easy to drink without adding any water. Tobacco, half baked oatmeal cookies, anise seeds and cumin. Yummy... After adding water sweet spices cover the tongue: Green cardamom, powdered ginger, vanilla chai latte and sweet peat smoke Finish: Long, warming and very pleasing. Cookie dough, cigar smoke and pumpkin pie. You feel every note slowly going down your throat. Overall: I did nail it for sure..! This is an amazing whisky... I wish I was scoring my tastings. This bottle will be definitely above 90. Now very carefully I am putting this beauty back to my cabinet and will make sure that every sip out of this bottle will count. I want to share it with friends. Gosh, I want to go back to Springbank Distillery so bad... Slainte to all my friends there..!